We humans operate according to a circadian rhythm. It’s a roughly 24-hour rhythm that sets the pace for our bodies and minds – in quite a steady manner. For example, ever wonder why we tend to get sleepy and hungry at the same time of day? That’s your circadian rhythm at work. In principle, we should try to follow these so-called internal clocks, and let our bodies function according to their pace. Disruptions in the rhythm (evident in shift-workers, for example) can cause different types of health problems such as sleep disorders, heartburn or ulcers. The circadian rhythm is encoded in us and it follows the 24-hour rhythm of the sun. One popular example of this alignment has to do with our sleep. Sunrise and light in the morning is one signal to our brain to wake up, whereas sunset and darkness are signals that tell us that it’s time to go to sleep. There are variations in our alignment to the 24-hour circadian rhythm. In other words, our internal clocks aren’t identical – our bodies operate in their own unique rhythms. This means that, among other things, we all don’t get sleepy or hungry at the same time. Some people operate with a slightly faster paced rhythm than the 24-hour cycle, and others have internal clocks that are a bit slower than the 24-hour cycle. This is another way of saying their circadian alignment differs. Our alignment to the circadian rhythm is called chronotype. For example, the slightly faster-paced individuals are often referred to as “morning people” – brisk, attentive and ready to go at dawn – whereas the slower-paced ones are often referred to as “evening people”, reaching their peak performance at dusk. Similarly to how people have different heights and weights, people also have different chronotypes. According to research, chronotype seems to be related to genetics. While circadian alignment can change a bit according to age, overall, it’s something we’re born with. This means that we should be aware of our own circadian rhythm. In addition, to avoid the negative health effects of circadian misalignment, we should schedule our lifestyle according to our own rhythm. But how can you know what your circadian rhythm is, and what does it mean for your daily life? The new Oura ring is the first consumer-available wearable that gives circadian alignment guidance. By tracking your long-term data regarding your sleep, recovery and activity, Oura is able to understand your personal circadian rhythm, and helps you to align your lifestyle to it. Aligning your sleep schedule with your own unique circadian rhythm is very important for getting adequate amounts of deep and REM sleep, both of which play a significant role in your recovery. It also helps in avoiding different types of sleep-related disorders and diseases. 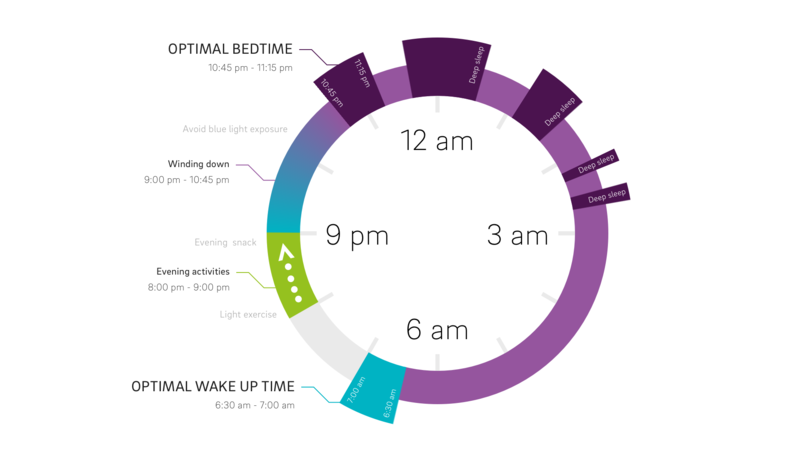 Oura indicates your optimal bedtime: the time when your body is most ready for sleep, resulting in healthy patterns of sleep stages and adequate amount of total sleep. Oura also guides you how to prepare for a good night of sleep in the evenings. Interested to know more about circadian rhythms, choronotypes and sleep? Visit the Oura shop and order the new Oura ring.